So after telling myself I'm gonna try making my own hotteoks for.... MONTHS, I finally got down to it! 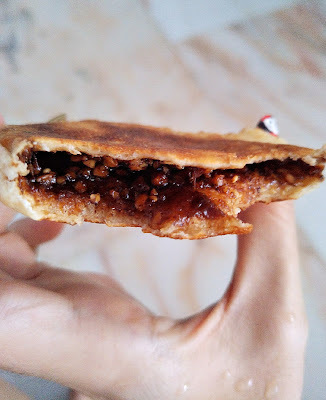 If you have no idea what hotteok is, it's a type of Korean street food, pretty much like a pancake but with sweet, cinnamon brown sugar peanut filling inside. And it is sooooo GOOD! 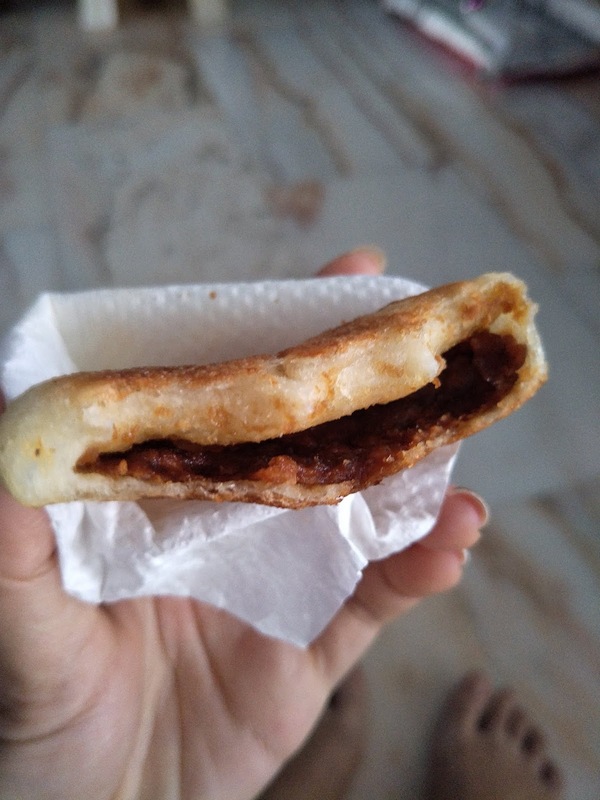 And so for my first try at making my own Hotteok, I decided to follow Maangchi's recipe fully, which uses only all purpose flour for the hotteok dough. 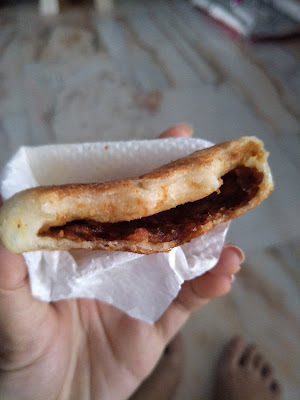 I notice that she fry her hotteok in ALOT of oil, but I wanted to cut down on the oiliness and tried with two batches, one with absolutely NO oil and one with just the bare minimum amount of oil. 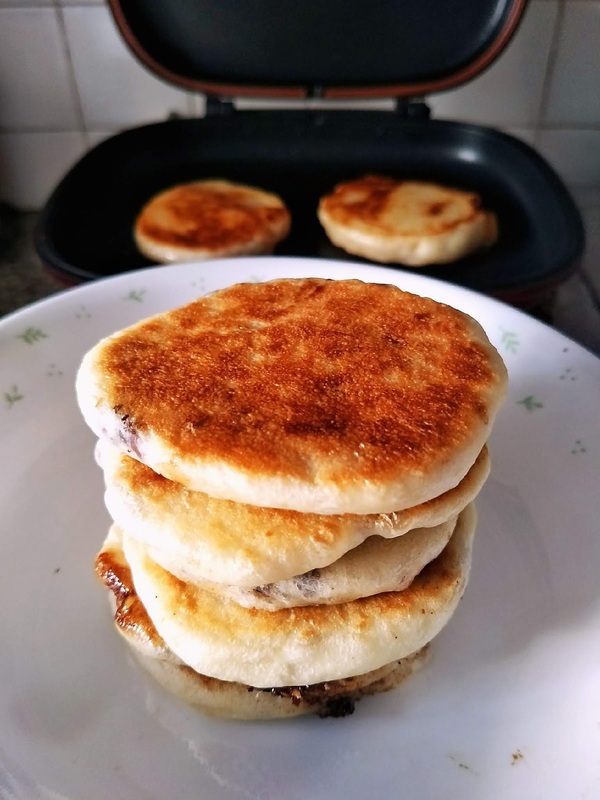 The traditional cinnamon brown sugar peanut filling with NO OIL. The version "fried" with absolutely no oil turns out extremely flat, dry and with a crusty-bread texture. I guess it would be acceptable if you're a fan of those extremely crusty and chewy artisan bread, but if you do not have healthy teeth (like my mum) and prefers soft and fluffy bread that resembles air, you'll going to hate this version. In comparison, the less oil version turned out a lot better! 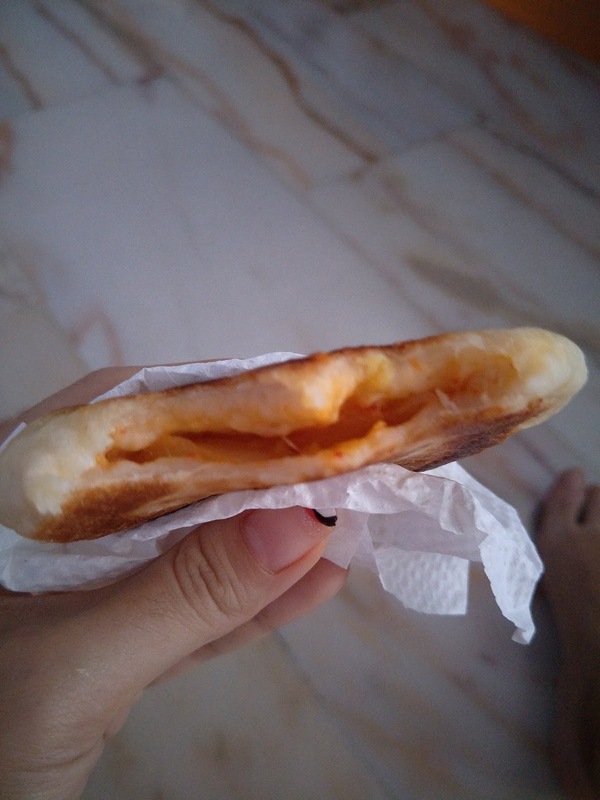 As you can see, the hotteok turns out way thicker and more "fluffy" in the middle. The pan-fried surface was crispy, and the insides more chewy and moist. YUMS! 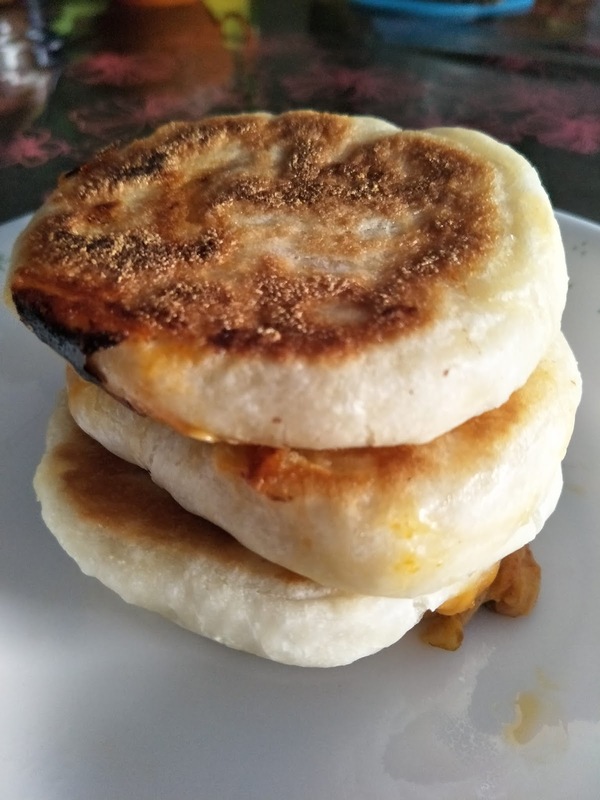 But still, I feel that the texture could be improved and it turns out that glutinous rice flour might be the answer as both Kimchimari's and BeyondKimchee's recipes uses them. I've chopped up some kimchi & mixed them with shredded mozzarella and red cheddar in roughly 2:1 ratio and used 1 heaping tablespoon for each hotteok. Mine ended up bursting quite a bit here and there as they cooked, so I will suggest that you decrease the amount of filling a little. For my dough, I've used the overnight fermentation method, which means I left my mixed dough in the fridge overnight (about 8 hours, or at least 6 hours) in a greased bowl, covered with cling film, for the 1st proofing. But if you do not have 8 hours to spare, you may set your mixed dough at a slightly warm place and let it double in size, which should take you about 1 hour. After the dough has doubled in size, check that it has fully proofed by sticking a finger into the middle of the dough. If the hole remains, the dough is ready! Turn out the proofed dough onto a well-floured surface and give it a quick knead before dividing it into 6 equal pieces. Set them aside and cover with a piece of cling film while you work on one piece. With well-oiled hands (the dough will be VERY sticky so oil your hands good! ), flatten a piece of dough on your palm and spoon a tablespoon of filling onto the middle. Then, slowly gather the sides of the dough together and press them seam down and seal up the dough ball. Make sure the seam is well sealed, if not your hotteok will just split open while cooking and make a mess in your frying pan. You may start frying the dough as you wrap them. I'll suggest that you do not finishing wrapping all and then only start frying (unless you have a large enough frying pan to fry all 6 pieces together) as these are yeasted dough and the last few will puff up and continue to grow as you fry the others first. As my pan fits only 2 comfortably, I will finishing wrapping two, plop them into the frying pan to fry up, and then go back to wrapping the next two. 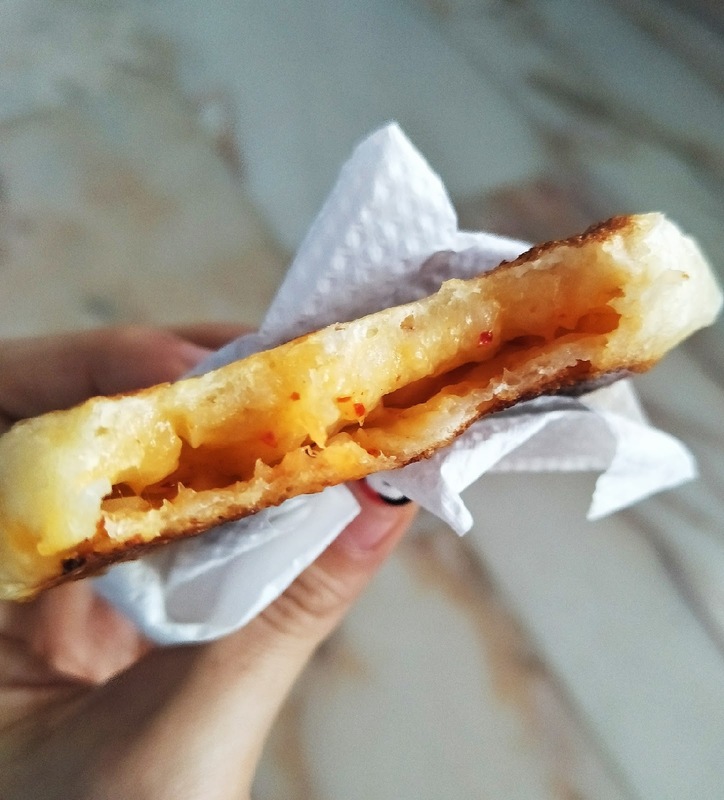 To fry the hotteok, place them seam side DOWN onto the oiled frying pan and fry for about 30 to 45 seconds first, just for the surface to "set". Flip the hotteok over and then immediately press them down with your spatula, or a hotteok press if you have one, to flatten them down. Then, cook on this side for about 2 to 3 minutes, until golden brown, before flipping back onto the seam side and cooking until golden brown. Well, because this time round I did use oil, but yet not a lot (or enough), I didn't manage to achieve the pretty, uniform golden brown surface. I'm happy with this though. HEH! This version turns out a lot more chewy, and with a slight rice-cakey chewy texture, which I absolutely adore. I even made one with speculoos filling, and it also tasted damn good! I'm now very sure it's impossible to have a speculoos-flavoured food item to taste bad.